Celtic fans will be counting the number of sleeps until their first Group B match on 12 or 13 September. How many are already looking to see how they can wangle a trip to Germany, France or Belgium? We'll have all the build-up, coverage and reaction to Celtic's campaign across radio, online and social media. We hope you can join us for that and we thank you for joining us today. Have a great evening. "This is what you want as a footballer," adds Celtic defender Kieran Tierney. "You’re in the biggest tournament there is. So, to go out there, and play against the best is what you want to do. Former St Mirren striker Steven Thompson on Celtic's striking options: "I feel as though he (Celtic manager Brendan Rodgers) needs another striker. He has used Scott Sinclair. James Forrest has done OK as an emergency striker but he's not a striker. I would have thought he'd have needed another centre forward. There are times when Moussa Dembele and Leigh Griffiths have not been fit and they needed another option. His argument is that in the Scottish league he doesn't need more than two and it would create disharmony to have more than two in there." Will Celtic add to their squad? St Johnstone manager Tommy Wright tells listeners to BBC Radio Scotland's Sportsound: "Brendan (Rodgers) is in a unique position in terms of the success he's had and the money that is coming in. Within reason, Brendan will get the players that he wants. Not that the board are forced into a corner, but they couldn't say no to him if he came up with '£8m for player X'. I think they would go and get him." 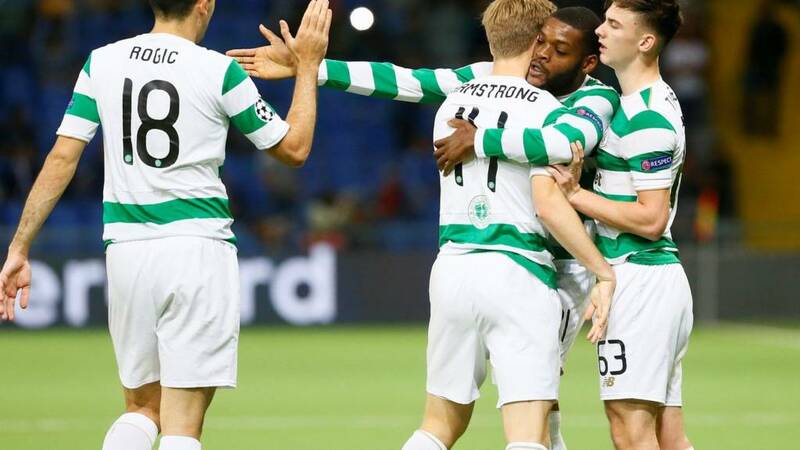 Celtic midfielder Olivier Ntcham says he is "very happy" about the draw for the group stage. "I am very excited," he said. "I said to my friend beforehand that I hoped we would play PSG. It is always good to play against a big player like Neymar. "Maybe [we can qualify from this group]. Everything can happen in football. For me, it is all about Champions League [last-16] qualification because the Europa League is not the same. "Playing in the Champions League was my first target when I came here so I am very happy. "For the fans of Paris, they are going to think it is an easy game for them, but in the Champions League we don't have easy games. I'm a supporter of Paris Saint-Germain. If you play for them, you are a big player." "It's a hard draw but we knew we were going to get that in the Champions League," says Celtic defender Kieran Tierney. "I'm looking forward to it. A few people had asked me: 'who do you want?' but I had no preferences. You know that you're going to get a tough group so you're just looking to do well. "Barcelona are obviously a great team - and Celtic have been known to get them in the group stage - I think the fans wanted something different. That's what they've got, so they'll be happy." "It's a hard draw but we knew we were going to get that..."Image caption: "It's a hard draw but we knew we were going to get that..."
"We'll work hard on the training ground and do our best. Last year [when Celtic drew twice with Manchester City] gave us confidence and was our first taster of Champions League football for a lot of us. "It's good experience going into this season. We've come a long way. It's great for the football club and great for Scottish football." Belgian champions Anderlecht have never won the European Cup or Champions League, but they enjoyed success in the European Cup-Winners' Cup in 1975-76 and 77-78 and lifted the Uefa Cup in 1982-83. Managed by Rene Weiler, the squad is mostly Belgian, with rising star Leander Dendoncker attracting interest from Everton. Anderlecht met Celtic in the Champions League 2003-04. The Belgians had their skipper Glen De Boeck sent off in the second half of their home leg but Martin O'Neill's side lost 1-0. However, Celtic got their revenge in Glasgow with a 3-1 win. Hedman, Varga, Balde, McNamara, Agathe, Miller, Lennon, Sutton, Petrov, Hartson, Larsson. Big-spending French club Paris Saint-Germain were second in Ligue 1 last season, eight points behind champions Monaco. The only time they have been drawn against Celtic previously was in the 1995-96 Cup-Winners' Cup, with PSG winning 3-0 in Glasgow and 1-0 in Paris. They paid a world record £200m to Barcelona for Neymar earlier in the summer. Under Spanish manager Unai Emery, they have won their first three league games this season. Former Celtic striker John Hartson: Some great teams in Celtic's group. Lets enjoy the ride and who knows where we can finish! "It's a big journey that you have to go on to qualify, " adds Celtic assistant boss Chris Davies. "It's great for the city of Glasgow and great for the country. Massive credit should go to the players and the manager for qualifying and I think it should never be taken for granted. "We didn't concede a goal up until the last qualifier [in the away leg against Astana] and performed really well in certain games. "The record that Celtic have in the Champions League at home is really strong. The feeling straight away, as the names come out, is excitement. We're looking forward to the games." Celtic assistant manager Chris Davies says they won't resign themselves to battling for third place in their Champions League group before a ball is kicked. The Scottish champions have been drawn with Bayern Munich, Paris Saint-Germain and Anderlecht. But while he accepts facing Bayern and PSG are "massive challenges" Davies believes Celtic can reach the last 16 - if their home form is good. "It was good to see the draw. I think we're happy with that. We've got two massive challenges there in Bayern and PSG. "Anderlecht are a team we can look to exploit as well. I think it [Group B] a strong group, they're all strong groups." Bayern Munich have won the Bundesliga for the past five seasons. They have been European champions five times and are the last team to win the competition three years in a row (1973-74 season onwards). Their most recent Champions League triumph was in 2012-13 when they beat Borussia Dortmund in the final. Managed by Carlo Ancelotti, the squad features many German internationals such as Manuel Neuer, Mats Hummels, Jerome Boeteng and Thomas Mueller bolstered by the likes of Robert Lewandowksi of Poland and Arjen Robben of the Netherlands. Celtic and Bayern were in Group A of the Champions League in 2003-04. They drew 0-0 at Celtic Park with Bayern winning 2-1 on their home turf. What do you make of Celtic's draw? Mike Wyzgowski: Settle for that, bit of glamour and straight shoot out for 3rd... Anything else a bonus. Brian Best: Decent chance of third spot in that group. Charles MacDonald: In that group, lucky to come 4th.